On May 17, 2013, JAXA started offering eight kinds of products whose physical quantity concerning water on the Earth, including precipitable water in the atmosphere and sea surface temperature, is calculated based on the observation data acquired by the Advanced Microwave Scanning Radiometer 2 (AMSR2) aboard the Global Change Observation Mission 1st-Water “SHIZUKU” (GCOM-W1). These products will contribute to capture environmental changes on a global scale such as the El Nino and La Nina Phenomena. In addition, they can also be utilized for other various fields both in Japan and overseas including weather and precipitation forecasts, efficiently finding fishing points, and enhancing measures against floods. JAXA has already started providing “brightness temperature products,” which indicate the strength of radio waves in a specific frequency emitted from the ground and in the atmosphere. JAXA has started offering brightness temperature products*1 from the onboard Advanced Microwave Scanning Radiometer 2 (AMSR2) of the Global Change Observation Mission 1st - Water "SHIZUKU" (GCOM-W1), after its initial calibration operation*2 was completed. We processed the original raw data acquired by the SHIZUKU with correction to reveal brightness products this time. 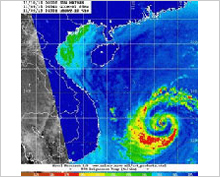 The products are expected to be widely used not only by domestic researchers and institutions concerning meteorology and weather changes including the Japan Meteorological Agency and other private weather forecasters, but also overseas meteorological institutions such as the National Oceanic and Atmospheric Administration (NOAA) of the United States. *1 Brightness temperature indicates the radio wave strength of a specific frequency emitted from the atmosphere and the ground. *2 Calibration operation: To improve measurement accuracy (brightness temperature accuracy), data acquired by an observation device (the AMSR2 in the case of the SHIZUKU) is evaluated, then the device as well as data processing software on the ground are checked and corrected if necessary. 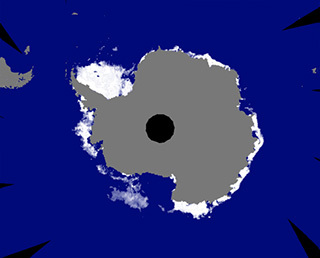 JAXA has been offering ocean ice data to the Japanese Antarctic Research Expedition (JARE) since Dec. 1, 2012. In the Antarctic area, two types of ice exist, drift ice which floats with the wind and ocean current, and fixed ice. For navigating in floating ice areas, information about drift ice is important as it moves around. The SHIZUKU can observe sea ice regardless of weather conditions, thus it is suitable for providing such data for navigation. Data provided by the SHIZUKU will be utilized for the navigation plan of the Japan icebreaker “Shirase”, which is transporting cargo to the Showa Station in Antarctica, for determining future ocean observation routes and points, and for navigation and observation plans for the ocean research vessel “Umitakamaru,” which will start ocean observations in late December. JAXA and the Japan Agency for Maritime-Earth Science and Technology (JAMSTEC) are collaborating in the Earth environment field by combining space and oceanic technologies such as merging data acquired by an Earth observation satellite and on-the-spot data obtained through an observation system deployed in the ocean. We started to provide data on the Arctic Ocean area acquired by the SHIZUKU to the National Institute of Polar Research (NiPR) for its voyage to observe and investigate the area using JAMSTEC’s Oceanographic Research Vessel “MIRAI”. The provided data is expected to contribute to NiPR’s research and safe navigation. We are sending MIRAI data including sea ice distribution, ocean temperature distribution and sea ice concentrations observed by SHIZUKU, which can conduct observations regardless of weather conditions, three times a day. SHIZUKU’s data is being used to find the best sailing routes and for selecting observation areas. The data on the Arctic Ocean area acquired this time by MIRAI, including the ocean surface temperature, will also be provided to JAXA in order to verify the accuracy of SHIZUKU’s data as well as to study environment changes such as analyzing recently decreasing Arctic sea ice. As a result of our analysis on sea ice data measured by the onboard microwave scanning radiometer aboard the Global Change Observation Mission 1st - Water "SHIZUKU,” Arctic sea ice levels shrunk to 3.49 million square kilometers, the smallest record in observation history. We found that the Arctic sea ice extended for 4.21 million square kilometers on August 24, which marked the smallest area in observation history. However, the area has continued to dwindle since then to mark a new record. 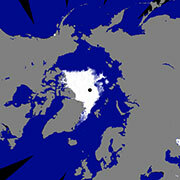 The temperature in the Arctic has already started to decrease and ice is gradually forming to expand sea ice levels. As a result of JAXA’s analysis on sea ice data measured by the onboard microwave scanning radiometer of the “SHIZUKU,” which has been observing the Earth, we confirmed that the sea ice extent in the Arctic Ocean has become the smallest this year in observation history. 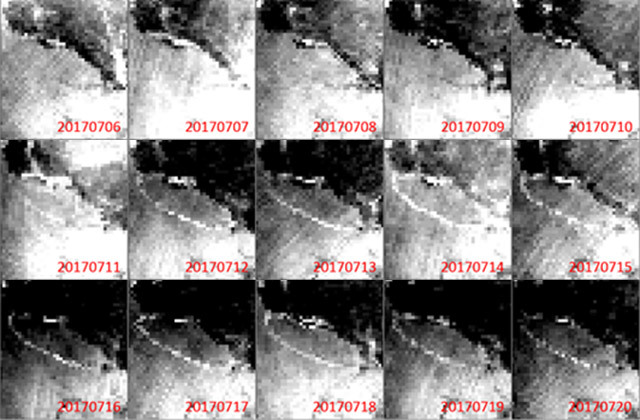 The extent on August 24 (JST) was 4.21 million square kilometers, and that fell below the smallest record of 4.25 million square kilometers marked in 2007 in satellite observation history. 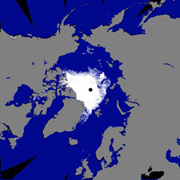 Arctic sea ice usually becomes smallest in mid to late September; therefore, melting will continue till then. 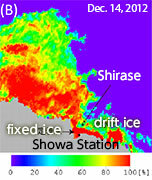 JAXA keeps monitoring the ice in the Arctic Ocean by the SHIZUKU to report the latest status. The Global Change Observation Mission 1st - Water "SHIZUKU" successfully deployed its onboard Advanced Microwave Scanning Radiometer 2 (AMSR), and the scene was shot by an onboard camera. The AMSR2 measures electromagnetic waves called microwaves emitted from nature such as the ground and ocean surface. It is an important sensor that observes water such as precipitation, vapor volume and the depth of snow. The Global Change Observation Mission 1st - Water "SHIZUKU" captured its successful solar array paddle deployment by an onboard camera over Australia. 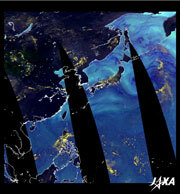 After SHIZUKU's orbit calculation, JAXA confirmed that the satellite was injected into the scheduled initial orbit. 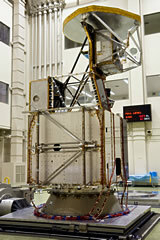 The SHIZUKU will deploy its onboard Advanced Microwave Scanning Radiometer 2 (AMSR). On April 26, the Global Change observation Mission 1st-Water "SHIZUKU" was mounted onto the payload adapter called the "Payload Attach Fitting," or PAF, at the Spacecraft and Fairing Assembly Building at the Tanegashima Space Center. The PAF is a connection part between the satellite and the launch vehicle. The launch site operations are smoothly in progress, and the SHIZUKU will be covered by the fairing and loaded onto the launch vehicle. On April 4, the media was invited to have a look at the Global Change Observation Mission 1st-Water “SHIZUKU” at the Tanegashima Space Center. 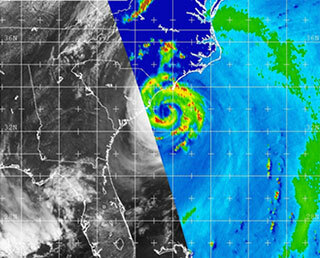 The SHIZUKU (GCOM-W1) is installed with the Advanced Microwave Scanning Radiometer 2 (AMSR2) to observe precipitation, vapor amounts, wind velocity above the ocean, sea water temperature, water levels on land areas, ocean ice area, and snow depths. The data acquired by the SHIZUKU is expected to be utilized for various fields including research on global environmental changes, weather forecasts, and fisheries. The satellite will soon be in final launch preparation operations to be ready for its launch on May 18. Launch date set for SHIZUKU & SDS-4 on H-IIA F21! Special site now available! The launch date and time for the H-IIA Launch Vehicle No. 21 (H-IIA F21) with the Global Change Observation Mission 1st - Water "SHIZUKU" (GCOM-W1) onboard was decided to be at around 1:39 a.m. on May 18 (Fri.,) 2012. The Small Demonstration Satellite-4 (SDS-4) will also be launched by the H-IIA F21 as a secondary payload. We opened a special site for the SHIZUKU, which is slated for launch in May. We will publish columns by project team members. Please have a look. On Jan. 10, the media was invited to have a look at the Global Change Observation Mission 1st- Water “SHIZUKU” at the Tsukuba Space Center. The satellite will be in the final launch preparation operations to be ready for its trip to space in Japan Fiscal Year 2012. JAXA is announcing the third research announcement (RA), which is the opportunity to conduct algorithm development, validation, and application research for the first satellite of the GCOM-W (Water) series, GCOM-W1, as well as multi-sensor research mainly using data from GCOM-W1. In this RA, JAXA solicits 3-year research proposals beginning from Japanese fiscal year 2011, for GCOM-W1 algorithm development, validation, and application research, as well as multi-sensor research mainly using data from GCOM-W1. JAXA will give priority to the areas of GCOM-W1 algorithm development and validation. JAXA conducted a sinusoidal vibration test of the GCOM-W1 protoflight model at the Tsukuba Space Center. GCOM-W1 satellite will be launched by H-IIA Launch Vehicle. Since a payload of a launch vehicle will experience severe vibrations due to engine combustion during its ascent, the satellite must be verified to withstand such vibration environment through a vibration test on the ground. During the test, the satellite was set on a table called a shaker table as you can see in the photo, and all the onboard devices were set in the same condition as that for the actual launch. Vibrations were generated through the shaker on the left of the table. All of the satellite devices were verified to work properly during vibration test of three axis directions and no abnormality was found on the satellite structure. For the test, we placed the satellite in an environment that was very similar to the on-orbit situation, and emitted radio waves to communicate with the ground facilities. We were able to confirm that the satellite properly operated without impacting the AMSR2 observation data. An antenna rotation test using a protoflight model (PFM) of the Advanced Microwave Scanning Radiometer 2 (AMSR2) was held at the Tsukuba Space Center. The AMSR2 will be loaded onto the GCOM-W1. The AMSR2's sensor unit rotates 40 times a minute in space, and it observes a swath of about 1,450 km on the ground surface per rotation. We had some limitations in simulating the impact of air resistance and the zero-gravity environment of space due to simulator restrictions for the ground test, thus the rotation speed was reduced to one tenth. Through the test, the rotation was verified to be normal. An antenna deployment test using a protoflight model of the Advanced Microwave Scanning Radiometer 2 (AMSR2) was held at the Tsukuba Space Center (TKSC.) The AMSR2 will be loaded onto the GCOM-W1. The antenna will be stowed when the GCOM-W1 is launched, and about 11 hours after the launch, bolts will be cut by pyrotechnics and the antenna will be deployed by a spring attached to the joint part of the strut. During the test, the impact caused by the antenna deployment was proved to be less than the specified level. We also confirmed that the deployment was successfully performed under the circumstance which simulates zero gravity in space. Symposium of "Expectations to the Climate Change Monitoring using Earth Observation Satellites"
The Japan Aerospace Exploration Agency (JAXA) is holding a symposium titled "Expectations for Climate Change Monitoring using Earth Observation Satellites" on April 15, (Thursday) 2010, at the Hotel Pacific Tokyo. Earth observation satellites have been playing an important role in monitoring climate change, and international cooperation is imperative for global-scale monitoring as a multiple number of satellites and various kinds of onboard observation sensors are required to cover the globe. JAXA has been planning to fulfill its international responsibilities for its satellites including the Greenhouse Gases Observing Satellite "IBUKI" (GOSAT) and the Global Changing Observation Mission (GCOM). At the symposium, representatives of space and meteorological organizations from all over the world will introduce their climate change monitoring initiatives by earth observation satellites, then explain how their activities have been promoted through international cooperation. We will also discuss future prospects for international collaboration. We are looking forward to your participation. At this symposium, JAXA and the organizations concerned report a background, a purpose, and a role of the GCOM plan, and the present status of the climate change research by the satellite observation. 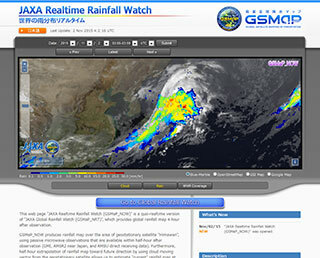 JAXA holds this symposium so that participants can understand the GCOM plan and the global environment issues. The GCOM project team performed the Sinusoidal Vibration Test on the GCOM-W1 structural model. The test aimed at verifying if the satellite's structural materials and its onboard equipment could withstand sinusoidal vibrations by simulating rocket launch vibrations. The test was completed without any problems, and all functions and the performance were confirmed to be normal. The structural model is for design verification to confirm if the satellite and its onboard equipment are strong enough for a space trip by exposing them under the simulated launch vibration and acoustic environment, as well as under simulated shocks at the time of atellite separation from the launch vehicle and solar array paddle deployment. A Thermal Vacuum Test using solar light on the Engineering Model of the HTS for the Advanced Microwave Scanning Radiometer 2 (AMSR2) to be aboard the Global Change Observation Mission 1st - Water (GCOM-W1) was performed in the 8M Chamber Building at Tsukuba Space Center from July 30 to August 4, 2008. This test was to check if the sensor works normally after it was exposed to the constant solar light by placing a model of the sensor to be aboard the satellite in a chamber simulating the space environment. As the first step in a series of the Global Change Observation Mission (GCOM) research announcements (RAs), the Japan Aerospace Exploration Agency (JAXA) announces the opportunity to conduct research activities directly related to retrieval algorithms for geophysical products, product validation, and data application of GCOM-W1. Participation in this RA is open to all categories of domestic and foreign organizations including educational institutions (except for students), industries, non-profit institutions and Japanese Government agencies.